Over the past decade India has seen a tremendous boom in cellular phone users. Today Companies in India see the cellular phone as an advertising medium just like the radio,television and the internet. A number of websites have sprung up that enable users to download and watch movies on cell phones. Text messaging which initially used only to message people is now used for surveys, games and voting.The Indian government is using the mobile medium to educate people in rural areas. So why did this trend of Mobile Marketing catch on in India and other developing nations? Why hasn't this trend caught on in the US for example? Data from the "Indian Mobile Market 2006" statistical handbook reveals that mobile ownership will pass 100 million in 2007 as 'the largest middle class in the world' takes up ownership. With 115.3 million forecasted mobile owners in 2007, India ranks 3rd in the world behind only China and the USA. Vast majority of Indians live in villages which are highly underdeveloped and face shortages of electricity. Cellular phones can be charged for small periods of time and can be used when there is no electricity. Hence a cellphone is probably one of the best medium to reach out to the rural customer.The ability to check on railway data or weather is a real enabler that people in poorly- connected parts of India are more than willing to pay for. In others, where the reach of cable and cinema is limited, the mobile is a great stand-in. A vastly young urban Indian population armed with handsets spends most of its time juggling between work and home and probably spend a lot of time traveling using public transportation.India is similar to Japan, Korea or the European Union where mobile data has taken off.All these countries have a mass transport system. Studies show that a big reason behind the success of mobile in Japan is the fact that people have a lot of time on the go. The US is mostly about self-driven cars. Just to get an perspective on this lucrative business, consider Indian Idol, licensed from the American Idol format, went on air on Sony Entertainment Television in October 2004.During the voting period from November 2004 to March 2005, Indian Idol got more than 55 million votes via SMS. At Rs 3 per SMS, that is Rs 16.5 crore (Rs 165 million). The telecom companies made Rs 11.5 crore (Rs 115 million), and Sony about Rs 5 crore (Rs 50 million). 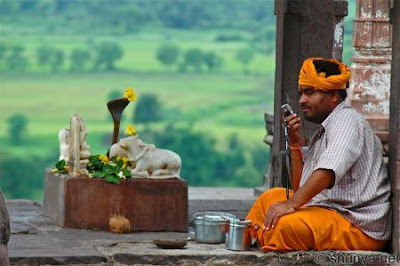 In the 1990's, everyone all over the world felt that the internet would connect everyone all over the world but today it is the mobile phone that is actually connecting millions of rural Indians with the world. I believe this trend is still in its infancy and we will see a number of profit and non profit companies using it as a tool for education, business and entertainment. Really interesting article on mobile marketing. Both content and styles are impressive.